Come celebrate the end of the 2017 CrossFit Open with us TONIGHT during our CFJ Open Showdown! Doors will open at 4pm, bring a side dish or treat and a beverage of your choice! We look forward to seeing all of you here! Big thanks to my wonderful judge <3 and DB for keeping me going! Wod rx 16:48 i think. I was tryin to breathe after it was over. Thanks Dennis and wife for keeping me going! After completing this WOD, I did one more set calling it my “Sydney Set”. Get your “Sydney Sets” in today folks! WOD as Rx’d = 11:45…..make sure your lungs are ready for this one! I second what Greg says. Great idea. Always get in a Sydney set! General Strategy and Warm Up You are ready, we double and thruster alot! CFJ here is a general strategy with some warm-up ideas if needed. Please know this is just a general write-up, adjust as you need, for you. Additionally there are multitudes of strategies on the web. Some great, some scary. Just remember, you know your body and how you have been training as of late. Do not over think this either. It is straight up work to be conducted at a high cardio respiratory rate with a moderate load and lots of reps of doubles (bodyweight technical energy consuming move). General Strategy: Be smart and start out controlled. This is 10 RFT, not 3-5. As you always here me say, build into it. Consistency, pacing, smart sets and short breaks. Do not Redline too early as you can redline easily in this one and it takes time to recover. Especially in a hot amped crowded heat, do not get caught up in a rookie mistake and blow it out in your first 3rds running someone else’s unknown pace. Once you hit halfway, this is when you want to know you have a strong five left in you. Consistent rounds with the ability to close strong I believe is what will separate most and has thus far. Some of you can and will go unbroken and really fast. If you can handle that pace and keep consistent rounds, then go for it. Others will need smart sets and a good rep scheme. What I have observed working so far, 5 and 4 on the thrusters and 20 and 15 on the doubles. Please keep in mind if you are strong at thrusters, but not doubles it may be 9 thrusters and broken doubles or if weak at thrusters and strong at dubs it may be 5-4 and 35. Know your abilities and engine. If possible close hard on the last round or two unbroken if able. Couple of other notes: Do not double under angry or frustrated. It makes it worse. As best as possible relax. RELAX. Breath, Breath and Breath. 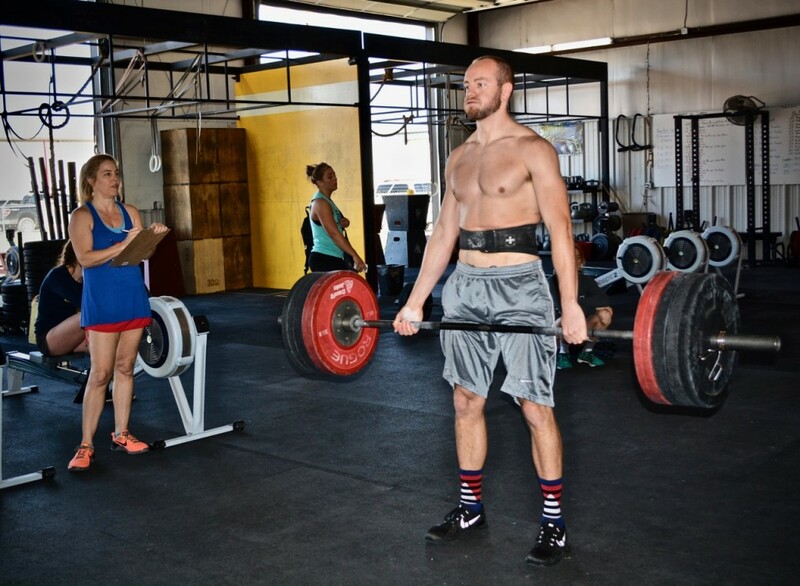 Take a big composure breath before each set of doubles and thrusters. Do NOT hold your breath on thrusters. Breathe every rep while maintaining midline stabilization. Get your Rack as ready as possible. 90 thrusters are double FRAN. The better the rack the better transfer of power form core to extremity elevating the bar. Stretch your Achilles and calves and get them to feel bouncy and light. Some of you today asked for a general warm-up to get ready for the 17.5 WOD with some common stretches we normally do. Please know this is just one general method. Feel free to adjust times, moves etc..
**The Key is you actually perform a good warm up and activate your energy systems, create the needed mobility and feel ready to battle and battle hard, at a tough but maintainable pace. Practice the moves of the WOD, do not overdo. You will need to get a good heart and respiratory spike before you go into this. Get the body ready for the shock coming and ready to start processing. Be smart when you start this one and build into it. –if needed one more round of 3 and 20. Do not overdo here. **Last OPEN WOD Crush IT!! Okie you are amazing!!! Thank you for taking the time to write that 🙂 good luck cfj, team Sydney!! Everyone in the evening class did an extra round for our sweet Sydney and the Sullivan family 🙂 thank you Greg for the idea! Can’t say how much I love this cfj family! Great job everyone and fun evening! Great job everyone! Yes thank u Greg for the idea of our Sydney round as we all completed that this evening! Sullivan family i could go on and on about the love we have for you all and what you all mean to our CFJ family and community. We wish you the best of luck with everything over the next several weeks. U all will be in our daily thoughts and prayers. Lots of love and hugs to u all! Another workout that exposed my lack of engine 🙂 excited for next year! Did the Open workout at CrossFit Poipu in Kauai. Thrusters were all unbroken if that really mattered on this one for me.